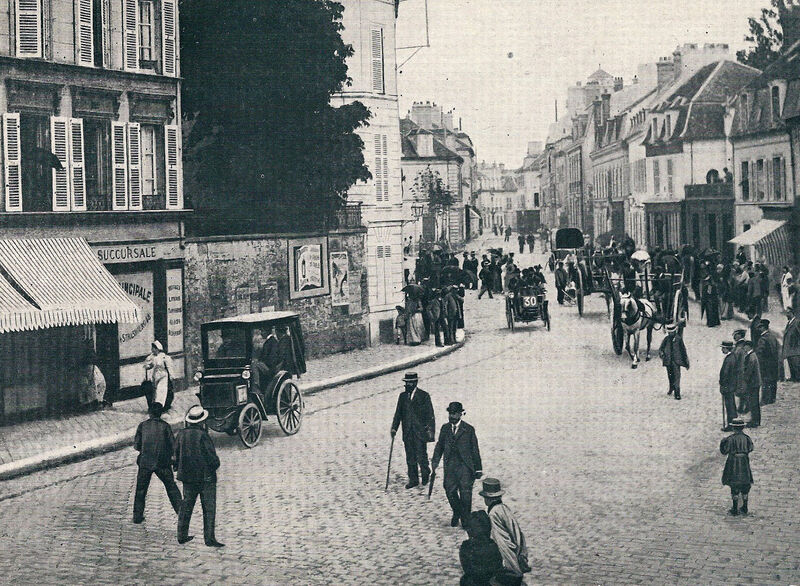 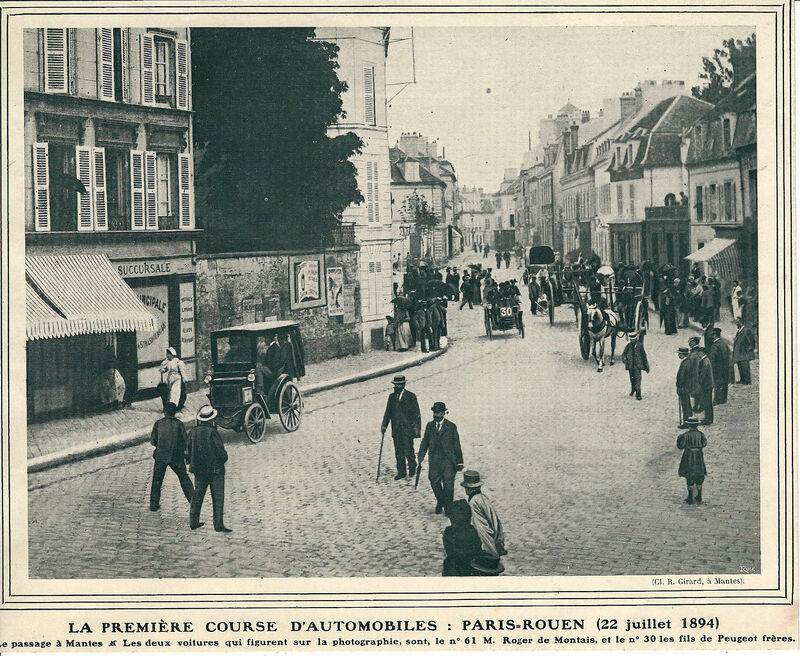 The first competition among motor vehicles is generally considered to be the 79-mile "race" from Paris to Rouen on July 22, 1894. 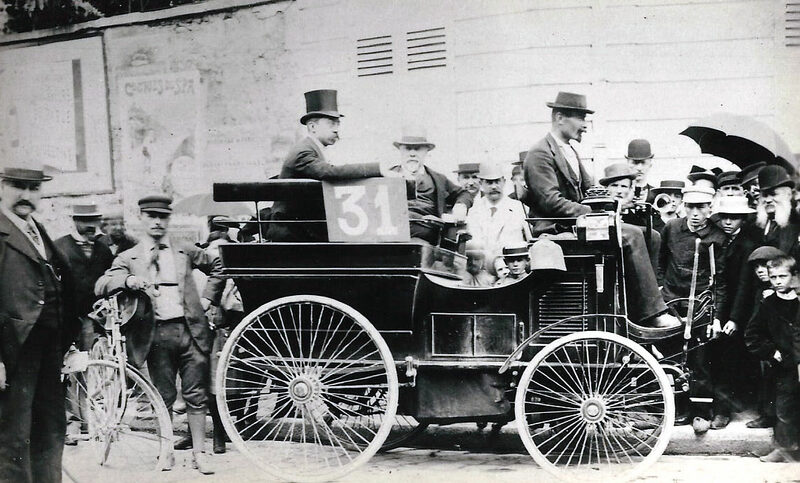 Thanks to the the Helck Family Archives, the 21 participants (six steamers and 15 propelled by gasoline or petrol) in this historic contest are documented below. 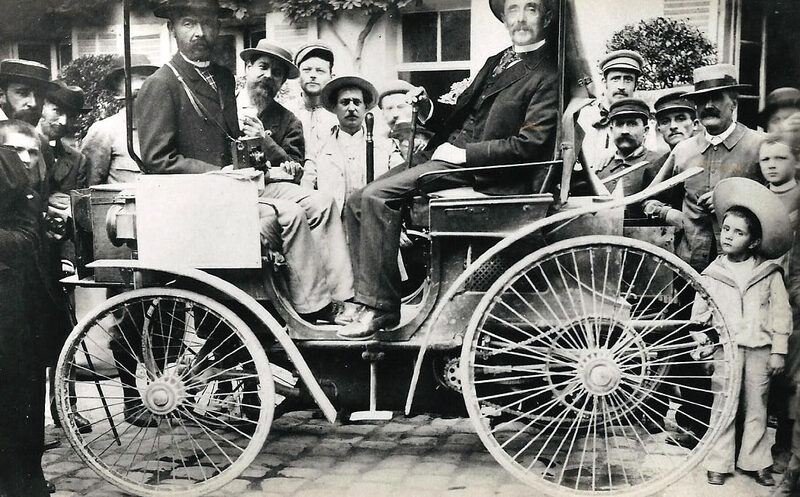 The first motor vehicle with a steering wheel was also one of the participants. 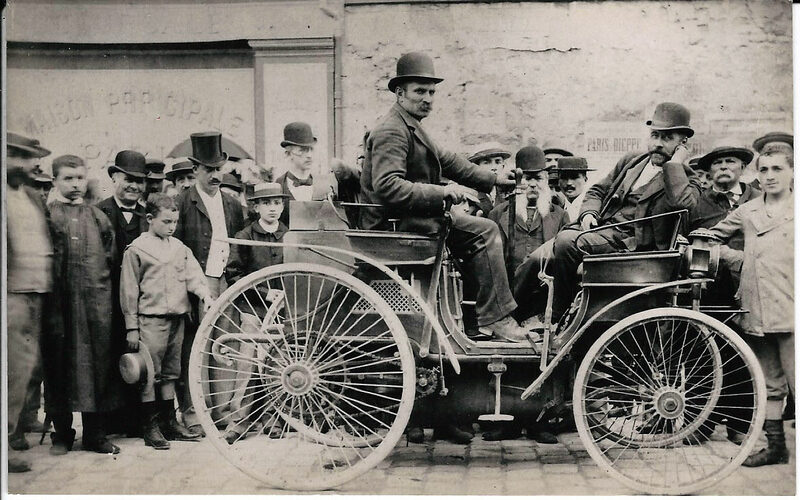 The photos are courtesy of The Helck Family Collection. 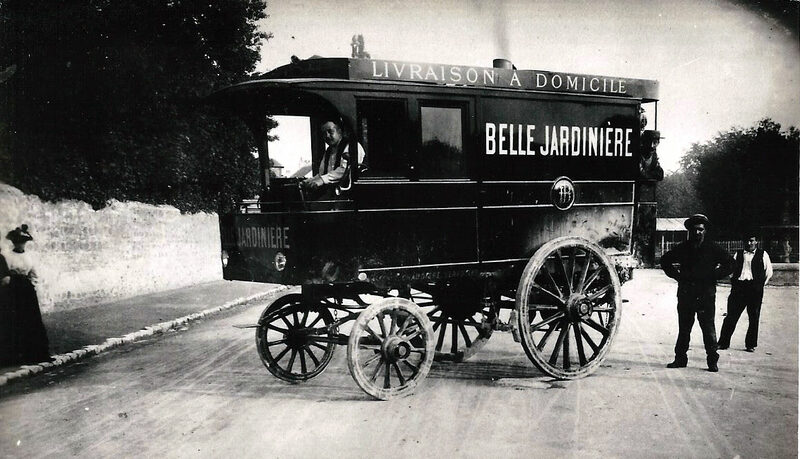 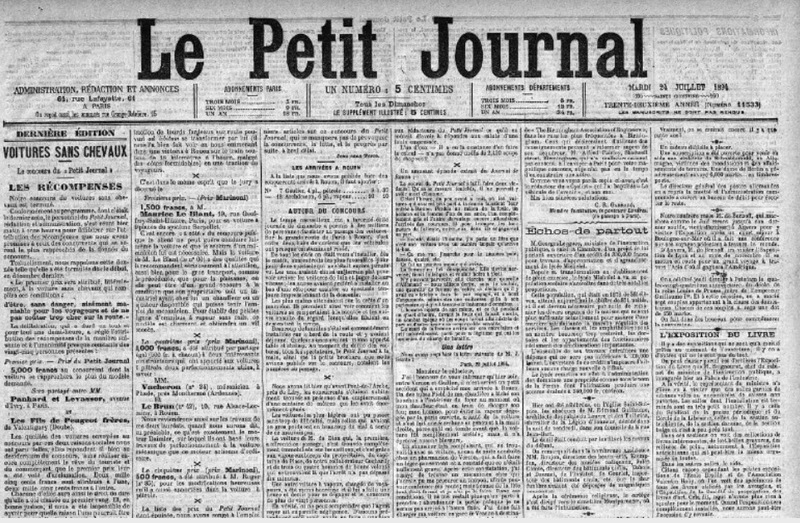 The contest was organized by the newspaper Le Petit Journal as the first contest of 'voitures sans chevaux" (carriages without horse). 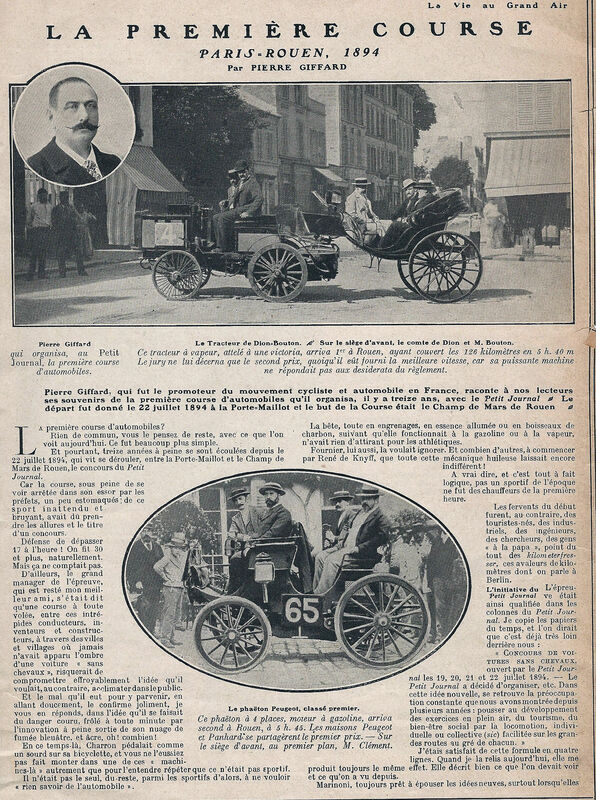 Le Petit Journal announced prize money totaling 10,000 gold francs for vehicles that met the ideal requirements of comfort, ease of handling, cheapness and freedom from danger. 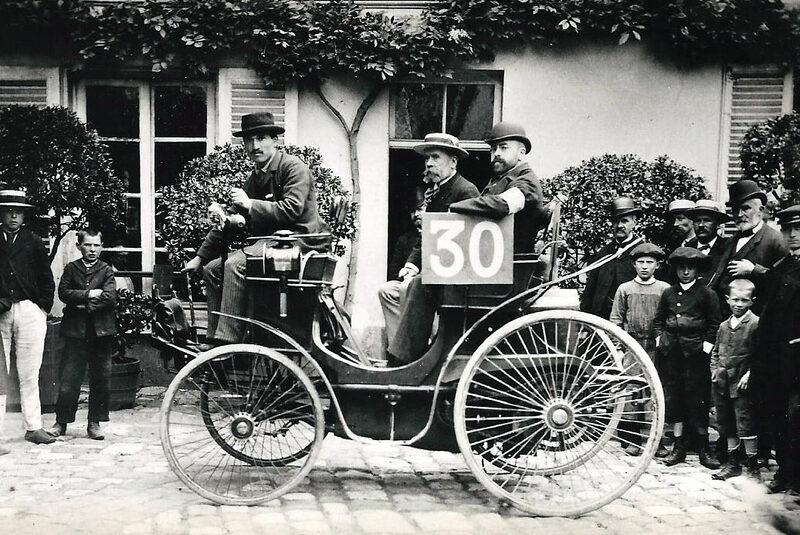 Reliability was more important than speed. 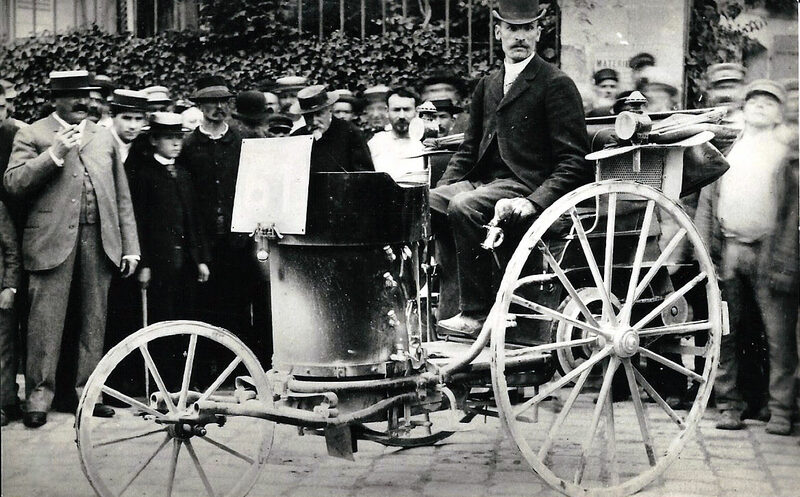 #4 De Dion- Bouton A steam tractor drawing a two-wheeled landau or "Victoria"
Driver/Entrant: Count Jules-Albert de Dion. 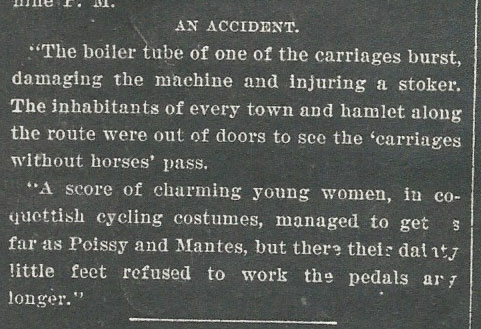 Finish: Stopped. 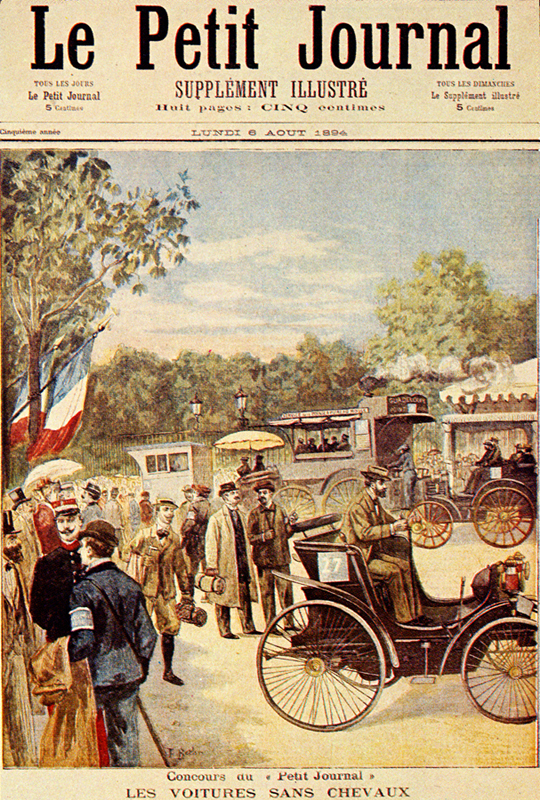 Did not finish. 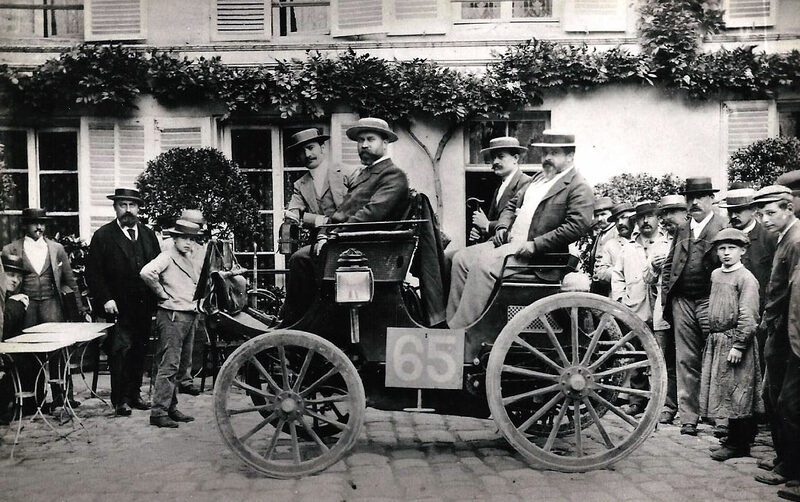 The #64 Panhard can be seen on the left. 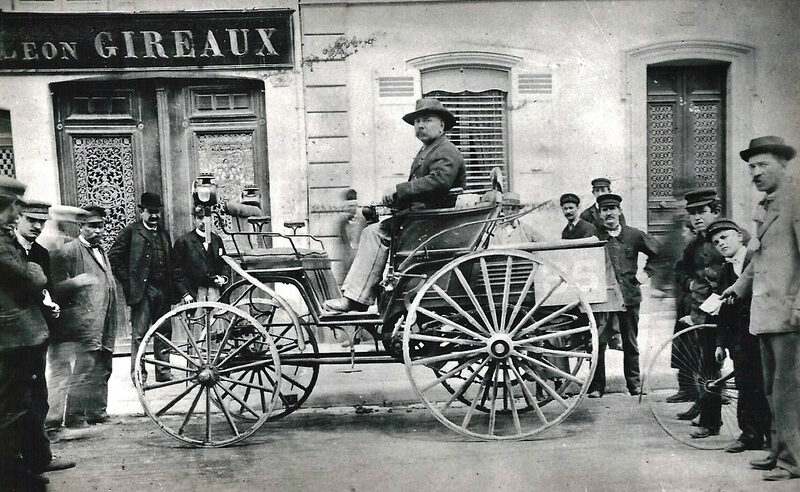 Driver/Entrant: Emile Roger (the world's first automobile dealer, selling Roger-Benz from1888 to 1896). 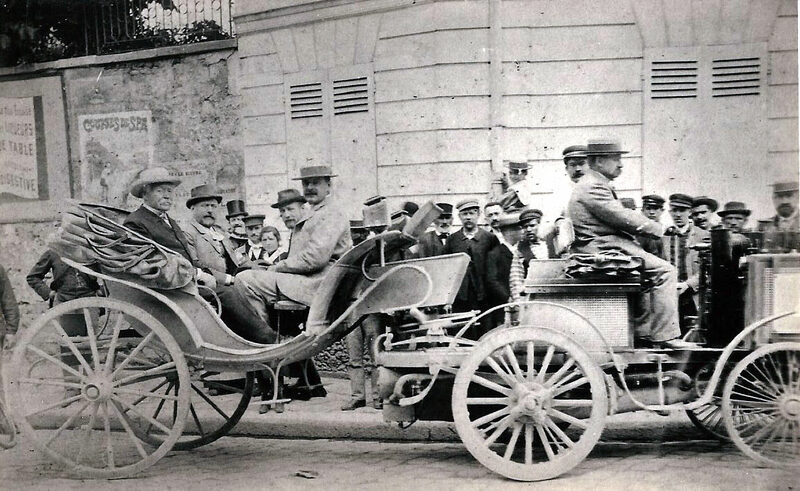 Awards- Five prizes were awarded at the end of the competition. 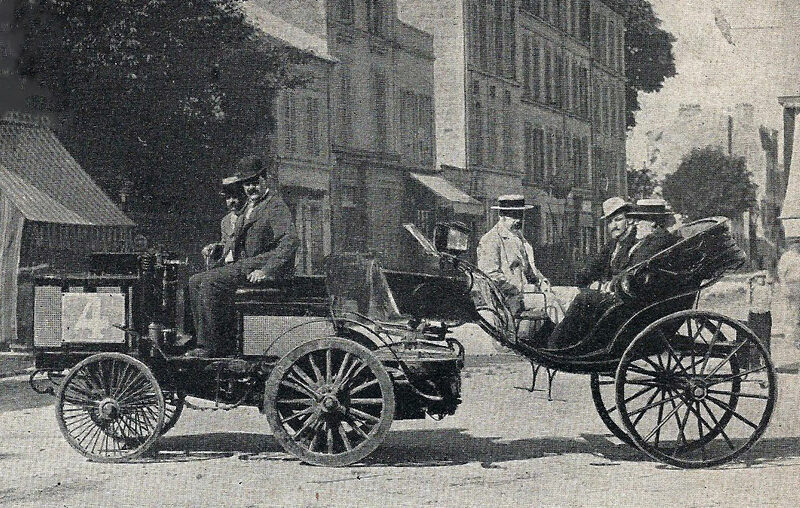 The # 4 De Dion-Bouton finished first in Rouen. 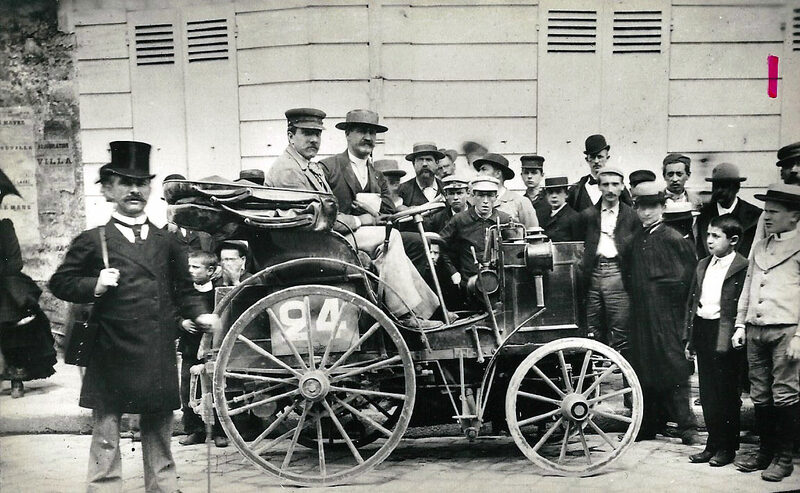 However, it did not meet "ideal" conditions of the competition- since it required a mechanic to keep the engine going and was too expensive and difficult to handle. 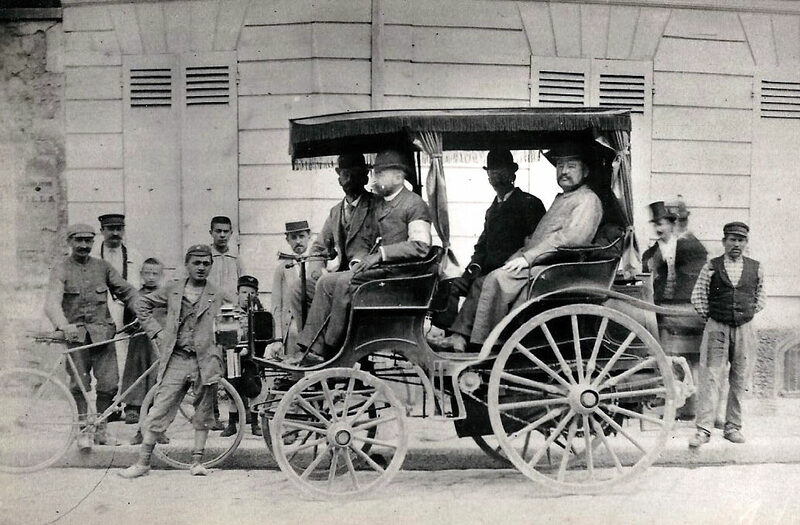 A total of 17 vehicles of the 21 participants finished the contest. 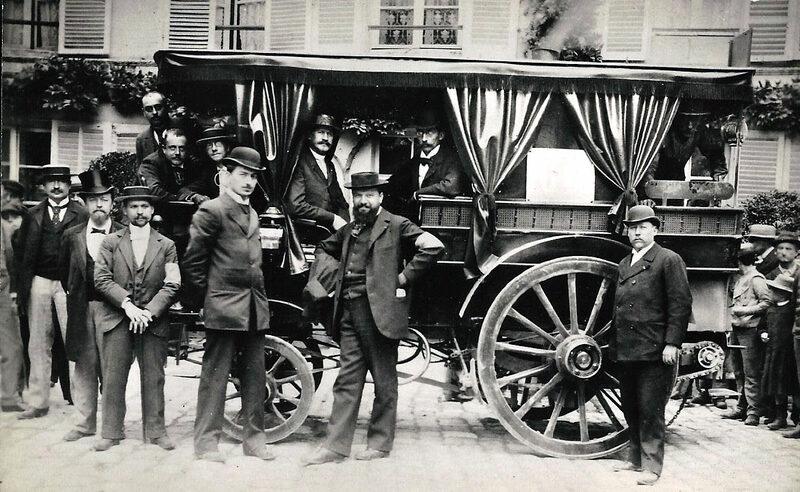 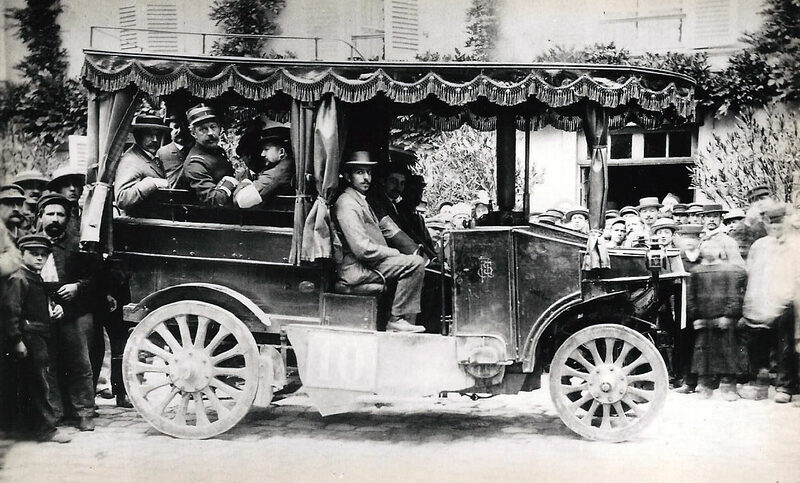 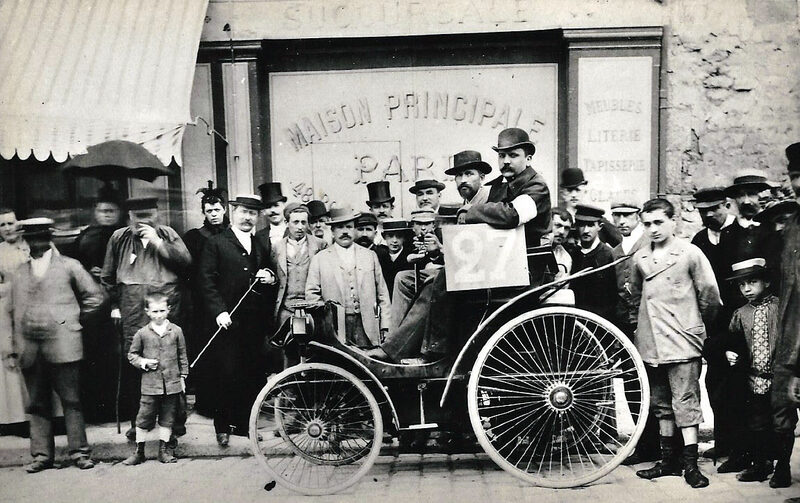 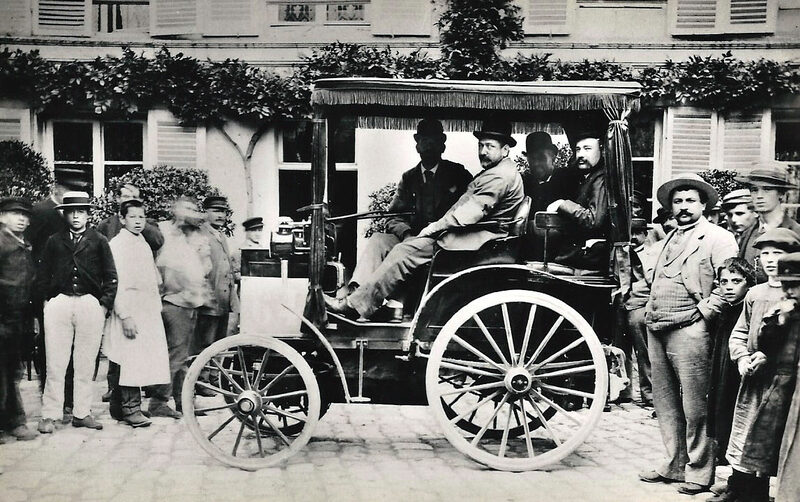 First prize ($5,000 francs) was shared by the Peugeot and Panhard et Levassor companies for both " employing the petrol motor invented by Herr Daimler of Wurtemburg" and whose vehicles "came closest to the ideal." 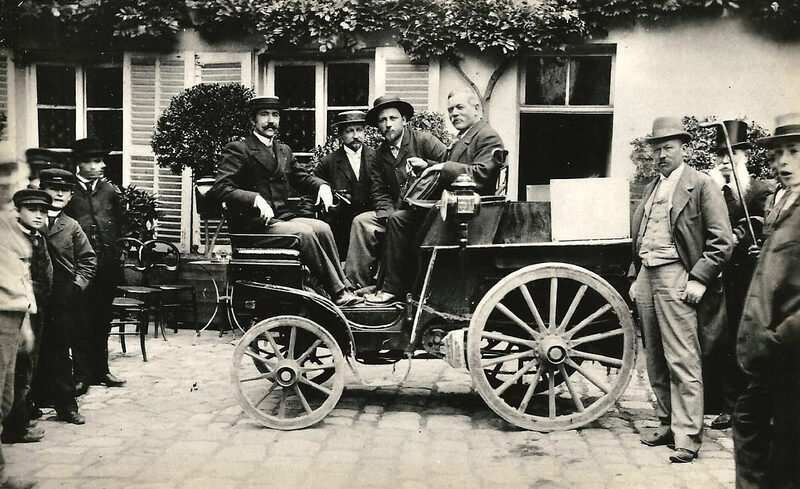 Second Prize ($2,000 francs)was awarded to the firm of De Dion, Bouton et Cie for their "interesting tractor (#4) that works like a horse and gives both absolute speed and pulling power up hills." 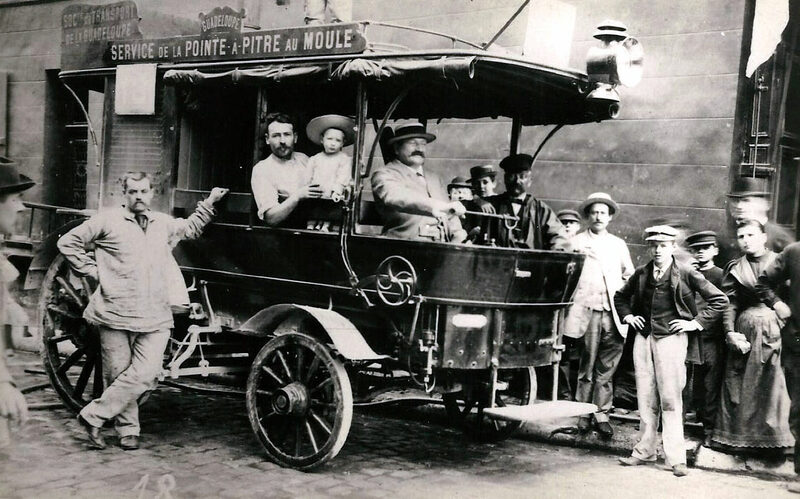 Third Prize ($1,500 francs): #19 Serpollet was awarded thrid prize because of "great possibilities as a light omnibus." 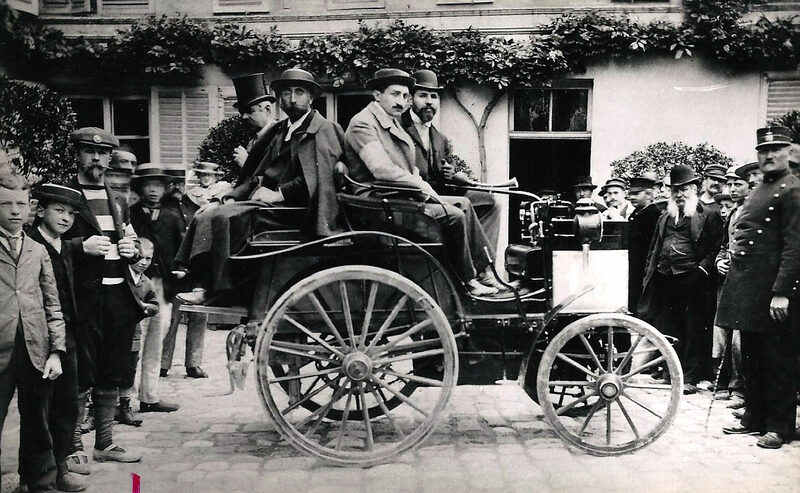 Fourth Prize ($1,000 francs) was shared by Vacheron (#24 Panhard) and Le Brun (#42 Le Brun) for "their improvements to the Daimler motor as applied to a carriage." 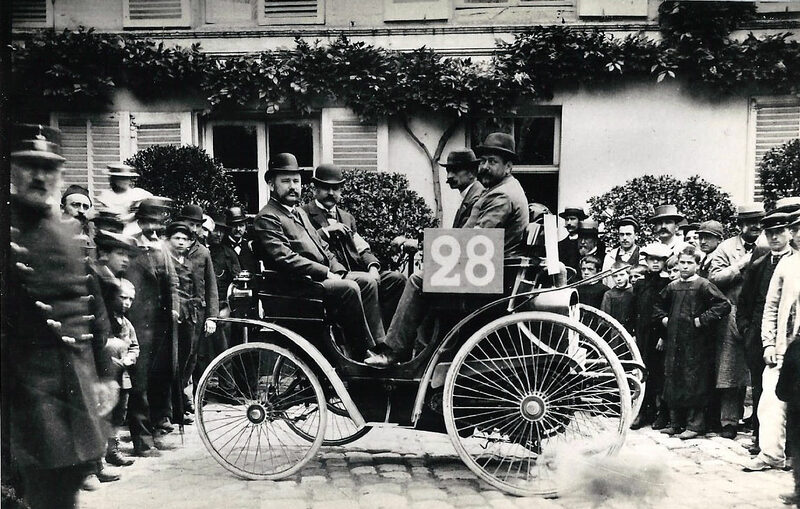 Fifth Prize was awarded to Emile Roger (#85 Benz). 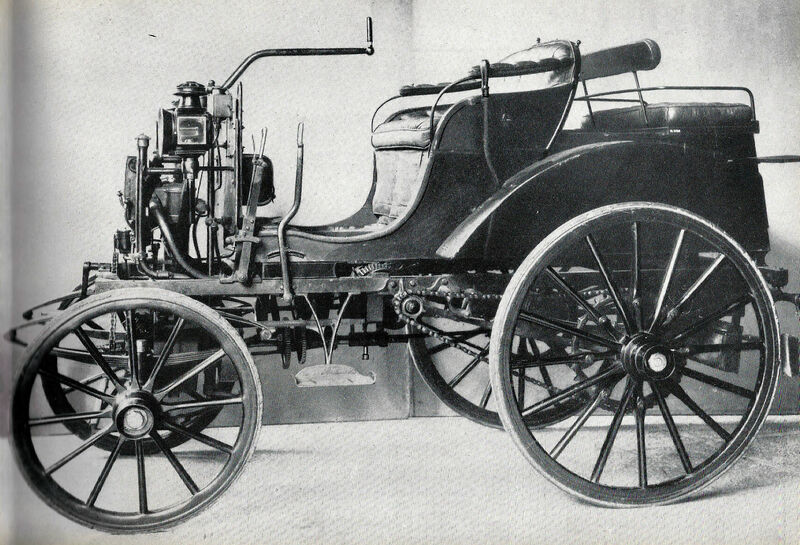 A consolation prize was given to J. Scottie (#10 Scotte) "whose steamer burst a boiler tube." 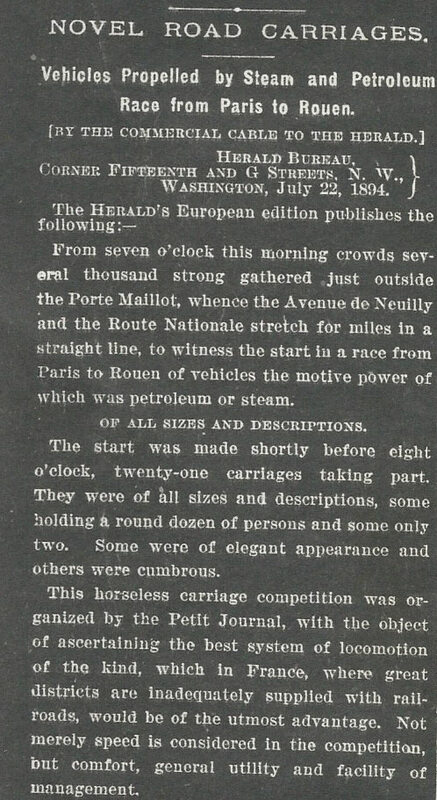 The August 8, 1894 issue of The New York Times reported the results in this article "Winners in the Road-Wagon Race." 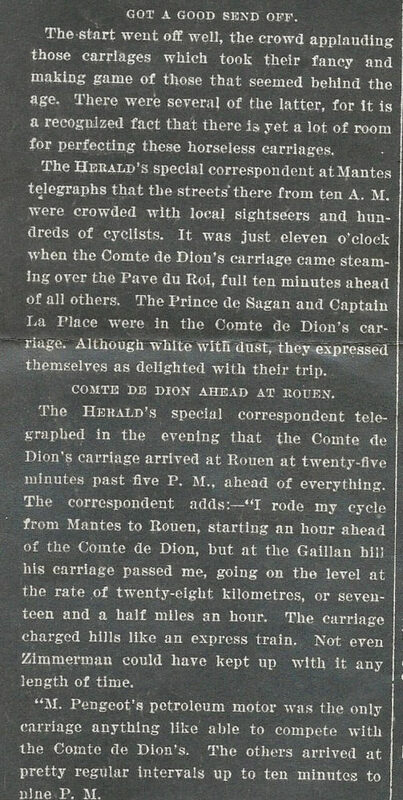 The New York Herald reported the results as "Novel Road Carriages- Vehicles propelled by steam and petroleum race from Paris to Rouen." 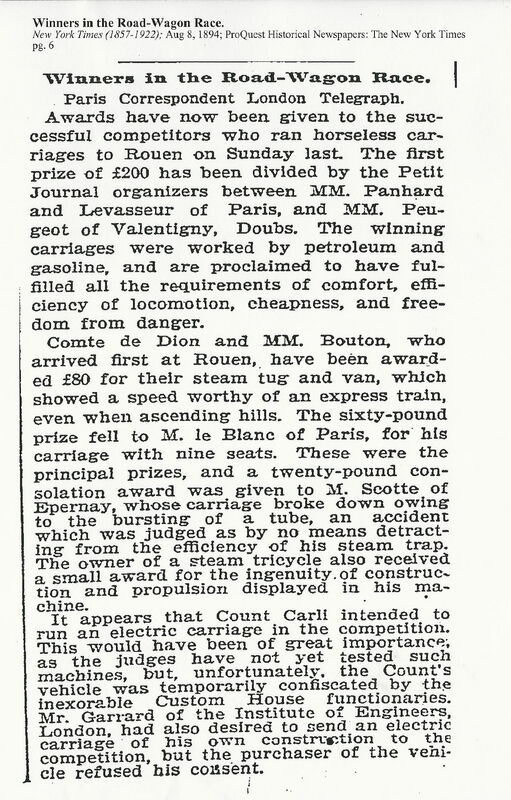 La Vie au Grand Air reported on "The First Contest"
Note the use of the term "automobiles" in this undated clipping. 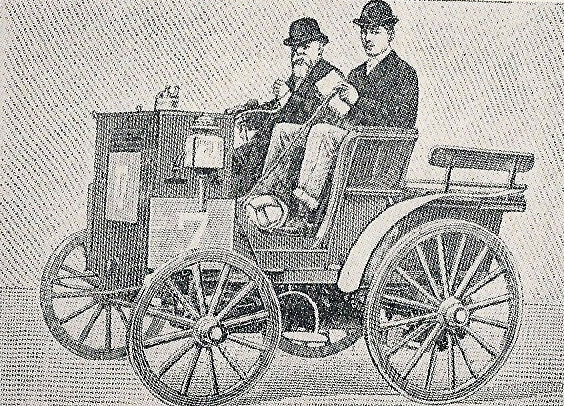 Sam, the previous published captions for this photo in books were wrong. 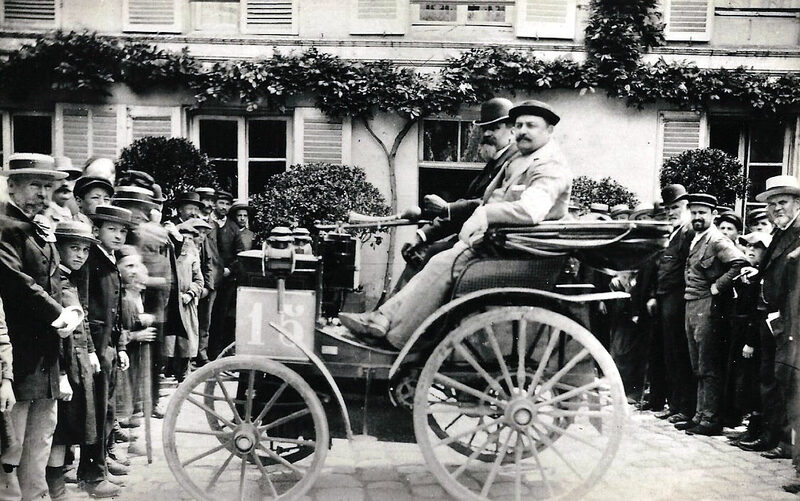 Clearly, the vehicle in the front was the #64 Panhard driven by Mayade.